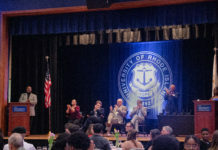 In years past, the University of Rhode Island’s annual Honors Colloquia have been based on topics like health care, public schools and cyber-security and privacy. This year, however, the lecture series is taking a new spin and focusing on the power of humor. The subject matter was first presented by university faculty members and friends, Rachel DiCioccio and Brian Quilliam. DiCioccio is an associate communication studies professor and Quilliam is a pharmacy professor and Associate Dean for Student and Academic Affairs. The two said they thought humor was a good choice, because it is so heavily incorporated into our daily lives. In order to be selected, the two created a presentation that they showed to the honors program that outlined how they would conceptualize a humor colloquium, as well as who the speakers would be that they would invite. One thing that they wanted to focus on was the breadth and depth of humor itself. Both coordinators said that they are most looking forward to meeting and engaging with speakers that are experts in their selected fields. DiCioccio went so far to compare the feeling to what she believes a kid goes through when seeing a One Direction concert. Now that the series is beginning in less than a week, Quilliam said that he and DiCioccio have received a great deal of help from the communications and marketing departments with getting the word out to URI and the surrounding communities. He added that word of mouth has been helpful in letting people know about a topic that is relevant to our society. The 2015 Honors Colloquium will begin on Tuesday, Sept. 22 at 7 p.m. in Edwards Auditorium for free with pediatrician, clown and activist, Dr. Patch Adams and his discussion on humor in medicine. The series will continue every Tuesday through Dec. 8. Previous articleShould Students Worry About On-Campus Employment?